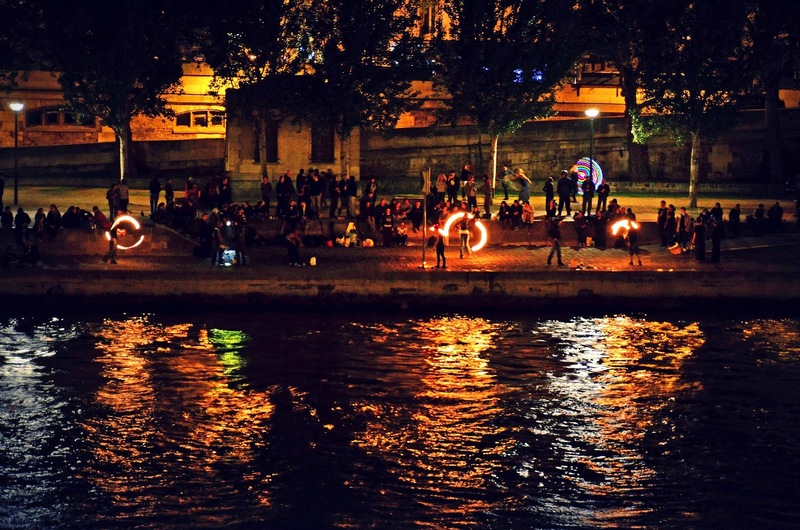 It's an amazing show that I witnessed yesterday from the Ile Saint Louis: a bunch of artists were literally playing with fire in front of a crowd. It was beautiful, much more than what this photo suggests. I searched on the web and did not find anything about them though. PDP picnic - still scheduled for Sunday, but I still have very little visibility about the weather, so I don't know about the location yet. Stay tuned. I've only seen that sort of thing in photographs. I'd love to get a look at this in person. Eric, I saw these artists last night, too, and I was trying to figure out what was going on. You've captured this so well! Très joli jeu de couleurs ! L'eau et le feu, très photogénique ! A ne pas mélanger mais à juxtaposer pour la beauté des reflets ! I got a shot of someone doing that in Venice once (it's one of my fave photos). Love the way the fire is reflected in the Seine.